Yep, you read that right. one. hundred. days. I just recently heard about the challenge and thought it was awesome. You can read all about the challenge here. It's basically a challenge to record 100 days of happiness in your life. 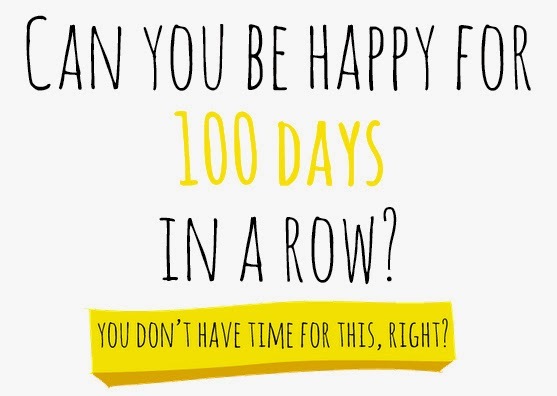 Document something that makes you happy every day for 100 days and share it! 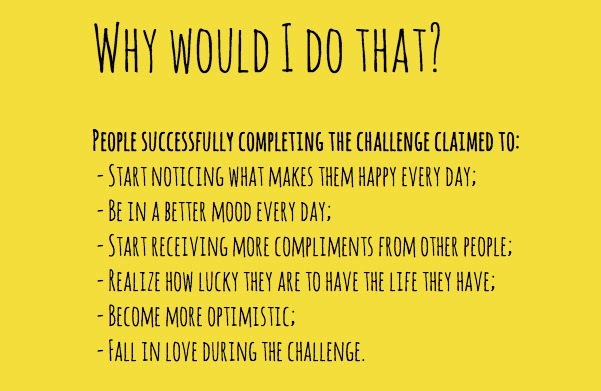 The challenge itself is very simple and the intention behind it is beautiful. I have personally been doing a lot of self-reflecting and re-evaulating myself as well as my life. I am really trying to get to the roots of what makes me- ME. What makes me different and unique? What are my weaknesses? What are my strengths? What are the things that define me, what makes me happy? I know for a fact that this challenge will help me grow as person and really begin to appreciate the small things in life. So, I am starting tomorrow. April 1st. Join me and many others on Instagram! Trying to think positive is definitely a good thing. But folks with mood disorders might not be able to accomplish such a thing, and should not feel bad if they can't. I wish you the best! I disagree. Since the challenge is about noticing even the smallest things that bring joy to your life, this exercise is probably even better suited to someone withs a mood disorder. Personally, I am trying to find the small things in every day life that make me happy so that I can be more grateful for what I have. I have to agree with Aubrey though. People with mood disorders can go from feeling happy then to sad or angry in a matter of minutes. So for those few minutes they are happy, to be able to discover what had made them happy can also help them by being able to identify triggers. Glad to see you're joining the challenge. Let's get happy! Thank you Aubrey! Yes, let's!